It's only 3&half;" long but adds enormous capabilities to DC. Using your existing DC layout and DC locos, you'll be able to control headlights, bell, horn/whistle, throttle and direction, as well as prime mover or steam sounds. You'll also be able to run up to three* trains on one track simultaneously, without block switches. And if that weren't enough, you'll do it all with complete wireless mobility. 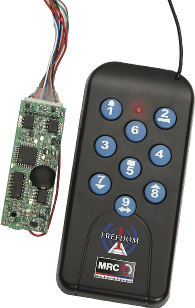 MRC's Freedom One is a pocket-sized, push-button, wireless controller. Just plug the receiver into any DC loco with an 8- or 9-pin DC connector and you're ready for lights, sound, action. The easy-to-use, wireless, walk-around transmitter delivers complete push-button control MRC's Freedom One, the simple way to expand your DC railroading experience without going DCC. Includes an FM remote transmitter and a receiver/sound decoder with standard NMRA 8-pin plug and JST 9-pin socket. Just set your power pack to top speed and run using the remote. Measuring only 50mm x 17.6mm x 7mm it fits most locomotives. Range is within 12 feet of the operating track. If you convert to DCC or run locomotives on DCC, the Freedom One DC sound module will operate with any NMRA DCC system. Its DCC features four-digit addressing, 128 speed steps and 28 functions. Each Sound Module consists of an FM transmitter and receiver that operate on one of three different frequencies (frequency A, B, or C), enabling independent operation of up to three locomotives at the same time. Each Sound Module consists of an FM transmitter and receiver, and operates on one of three different frequencies (frequency A, B, or C), enabling independent operation of up to three locomotives at the same time. Includes 22 airhorns and 8 bells.